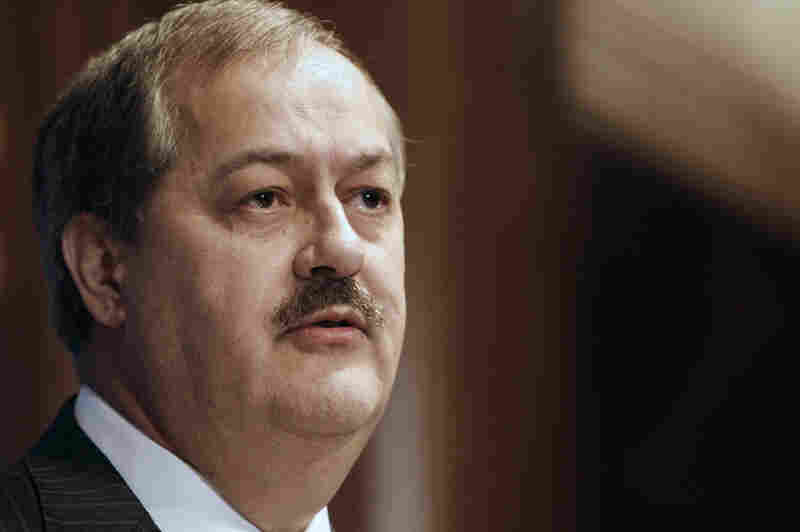 NPR Challenges Gag Order In Mine Disaster Case Five news organizations are challenging a sweeping gag order issued in the federal criminal case against former coal mining executive Don Blankenship. NPR and four other news organizations are challenging a sweeping gag order issued in the federal criminal case against former coal mining executive Don Blankenship. Blankenship was indicted on November 13 in Beckley, W.Va., on charges of conspiracy and securities fraud. The charges stem from the 2010 explosion at the Upper Big Branch coal mine in which 29 workers died. The mine was owned by Massey Energy, and Blankenship was the company's CEO. Don Blankenship, former CEO of Massey Energy, is accused of thwarting mine safety enforcement and conspiring to violate mine safety law. Today in court, the Associated Press, the Charleston Gazette, the Friends of West Virginia Public Broadcasting, the Wall Street Journal and NPR filed a motion saying that U.S. District Judge Irene Berger has erected "a barrier to the public's full understanding of these newsworthy proceedings." An order from Berger on Nov. 14 blocks public access to all court documents in the case, and prohibits public discussion of the trial by any of the attorneys involved, actual and potential witnesses, Upper Big Branch victims and relatives of victims, investigators, court personnel and Blankenship himself. "The gag order is a prior restraint" on people, including Blankenship, who have been willing to speak publicly, the motion contends. The complete sealing of motions and other documents filed by the U.S. Attorney and Blankenship's defense "has blanket impact, thereby depriving the press and public of access to all past and future court records in this case." Berger said in her gag order that given prior publicity about the mine disaster "the Court finds it necessary to take precautions to insure that the Government and the Defendant can seat jurors who can be fair and impartial and whose verdict is based only upon evidence presented during trial." Media law attorney Sean McGinley, who represents the news organizations, says in his motion that Berger issued the gag order without hearing any arguments or evidence about pretrial publicity and fair trial concerns. "There has been no showing that all speech about 'the facts or substance of the case,' or that all court filings, pose a sufficient threat of harm to a fair trial interest that justify the gag and sealing order," McGinley's motion says. Some relatives of Upper Big Branch victims have defied the gag order with no apparent consequences so far. Tommy Davis of Kanawha County, W.Va., lost his son, nephew and friends in the Upper Big Branch explosion. He told WCHS TV he would not stay silent. "How could she take my rights, and my thoughts and my feelings and put 'em in a jar...?" Davis asked in the WCHS interview. "Everything that I loved in my life is gone... What I got to be scared of?" The motion filed by NPR and other news organizations asks Berger to reconsider and vacate the gag order. It suggests alternatives — common in high-profile trials — such as careful jury selection, sequestration of the jurors and jury instructions that emphasize deliberations must be based only on evidence presented during the trial.